While more Latinos are heading to college than ever before, Latino males lag behind other groups—even behind Latinas—in obtaining a four-year degree. To shed some light on this issue, a group of scholars from across the country published their research in a new book titled Ensuring the Success of Latino Males in Higher Education (Stylus Publishing, Jan. 2016). 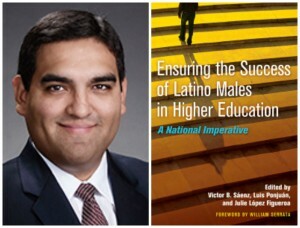 We sat down with Dr. Victor Sáenz, co-editor of the book and associate professor in the Department of Educational Administration, to learn more about the many complex factors that keep Latino males from succeeding in post-secondary education – and why bridging this persistent achievement gap is a national imperative. What is causing Latino males to underestimate the value of a college degree? First let me offer some data. While the number of Latinos attending college and attaining degrees has increased steadily in recent years, the proportional representation of Latino males enrolled in higher education continues to lag behind their female peers. In 2012, Latino males had the lowest high school graduation rates across all male ethnic groups, and more than 60 percent of all associate’s or bachelor’s degrees earned by Hispanics were earned by female students. These trends suggest that, compared to their peers, Latino males continue to face challenges in achieving critical higher education milestones. That said, I wouldn’t necessarily conclude that Latino males are “underestimating” the value of a degree. Many simply find other means to make a living that may not include a higher education credential, perhaps because they feel a more immediate urgency to be a breadwinner or provider for their family. Why is it an economic imperative to close this achievement gap? One way to answer this is by considering the relationship between demographic trends and economic health. Because the Latina/o community is so young and is growing so rapidly in states like Texas and California, there’s a demographic reality that is winding its way through our schooling systems. That said, if half of the fastest-growing racial/ethnic group in the country is stubbornly lagging behind everyone else on key educational metrics, this persistent gap could have dire consequences on the long-term viability of our economy and our communities. Latino males in the workforce are concentrated in low-skilled, low-wage jobs, and they have more instability in their employment status. This translates into stunted economic opportunities for Latino males. When coupled with demographic trends this portends a dire economic outlook. The book examines the factors that inhibit academic success for Latino males. Could you highlight a common barrier that keeps them from completing a post-secondary education? One common barrier for Latino males that may keep them from completing a college degree is the financial pressures they may be facing to help contribute to their families. Because many are from working-class backgrounds, the immediate urge to join the labor force may outweigh the long-term gains that can flow from a higher education credential. Research in the book covers an array of factors that promote Latino success in higher education. Could you give an example of one of those factors? There are several factors we can spotlight. Increasing the achievement of Latino male students requires policy and programmatic interventions that attend to the needs of students both long before they arrive on campus and also immediately after they arrive. We should consider how support is extended through social networks (e.g., college access programs, financial aid). We should also carefully design “on-ramp” experiences for Latino male college students that immediately gets them engaged and connected on our college campuses. Finally, we should re-design our existing orientation and intervention programs with “men in mind”, mindful of the myriad challenges we may face to get Latino males engaged on our campuses. You direct Project MALES (Mentoring to Achieve Latino Educational Success), a student mentoring program in UT Austin’s Division of Diversity and Community Engagement. How can programs such as this help increase Latino males’ college graduation rates? Our Project MALES Student Mentoring Program is focused on the goal of enhancing Latino male academic success through near-peer mentoring, and to inspire others to take action and respond to the growing national imperative for Latino males in education. The Project MALES Student Mentoring Program connects Latino male undergraduate students from UT Austin (and allies) with males of color in local area middle schools and high schools. We require all of our undergraduate student mentors to enroll in a service-learning course called Instructing Males through Peer Advising College Tracks (IMPACT). Once out in the field, our undergraduate mentors work on improving the college-going culture for young men of color while also providing a safe space for these students to discuss questions related to going to college. They discuss a variety of topics ranging from college preparation to financial literacy to the “soft” skills necessary to succeed in college and beyond. Our Project MALES Student Mentoring Program can serve as a model for other institutions because we are leveraging the intellectual capital for the benefit of our local community while also providing a dynamic experiential learning experience for our undergraduate mentors. Why is it important to raise national awareness about the educational crisis facing young Latino males? This is an important time to raise awareness about the educational challenges facing Latino males because many national, state and local conversations are expanding the definition of males of color to include Latino males and other historically marginalized groups of male students. The shifting demographic reality represented by the growth of the Latina/o community also gives our focus on Latino males a singular urgency. President Obama’s My Brother’s Keeper (MBK) initiative has brought the educational challenges faced by male students of color to the forefront of education policy discussions. Launched in February 2014, the MBK initiative seeks to improve the educational and life outcomes for boys and young men of color. MBK has brought together public and private organizations, school districts, city leaders, community activists, scholars, students and families, and philanthropic organizations that have pledged a long-term commitment. All of these stakeholder groups represent key target audiences for our book. This book is an ambitious attempt to spark greater awareness and dialogue about Latino males, a fast-growing and increasingly important segment of our national population. It synthesizes the perspectives of new and emerging voices, including graduate students, academics, administrative professionals and higher education leaders. The contributing authors paint a complex portrait of the many factors that contribute to the educational experiences of Latino males in elementary, secondary, and post-secondary education. This book represents a commitment to better understand the Latino male educational experience, and its contributors’ hope to parallel the broader and vibrant research agenda on male students of color in higher education. Finally, given the growing state and national imperative to “move the needle” on Latino male student success, this book is a call to action for researchers, educational practitioners, community activists and higher education leaders.